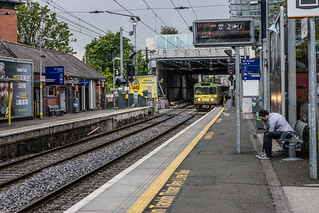 Lansdowne Road railway station serves Lansdowne Road in Dublin, Ireland. There is a level crossing because the railway line is almost level to the surrounding land. The station serves the 'white collar' businesses of the Ballsbridge and Upper Baggot Street areas of Dublin 4. The station was adjacent to its namesake Lansdowne Road Stadium before the stadium was torn down in 2007 and replaced on-site by the new Aviva Stadium, which the station now serves. It has level access to both platforms. The station opened on 1 July 1870.